The implementation formula of this edition was the same as in the previous years: a theoretical and practical part. 24 April to 27 April 2018 - During this week, the working groups visited schools selected by MEST and distributed coloring books “How to move safely on the road” and tests developed by traffic experts for evaluating knowledge of pupils with regards to the traffic rules and signs to pupils of grades 1, 2, 3, 4 and 5. 18 May 2018 - The practical part included lower secondary schools from different municipalities of the Republic of Kosovo. 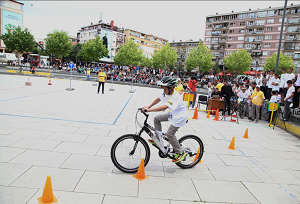 Each of the participating schools (selected by MEST) selected three representative students, respectively of 6th, 7th and 8th grades to compete in bicycle races, which tested students’ technical skills in bicycle riding. Whereas after analyzing pupils' result, were announced the Kosovo champions of this edition.